There’s an element of social commentary literally inked into every Gorillaz record. The “virtual band” formed by Blur frontman Damon Albarn and illustrator Jamie Hewlett in the late ‘90s uses two-dimensional cartoon avatars to skewer one-dimensional pop stars and the superficial culture in which they thrive. And that’s only the beginning. Because he’s able to filter his ideas through animated creatures, Albarn is free to lob rocks at mankind like a mischievous outsider. 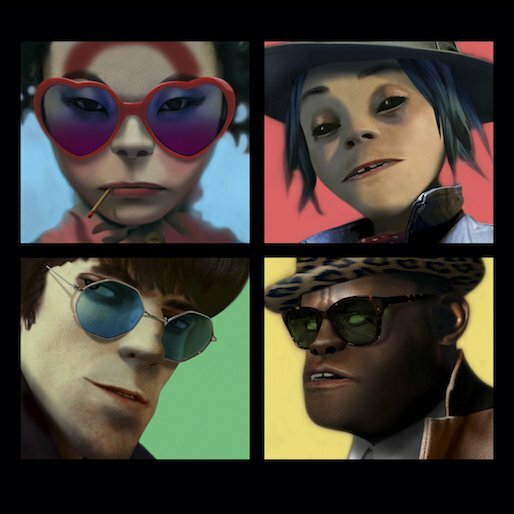 On Humanz, the first proper Gorillaz studio album since 2010’s Plastic Beach, Albarn is more interested in patching wounds and forging connections. “I am a satellite, and I can’t get back without you,” he sings like a lonely astronaut on the spare synth-ballad “Busted and Blue,” the only non-interlude track without a featured vocalist. Going into Humanz, Albarn asked his collaborators to “imagine a night where everything that you believed was turned on its head.” The subtext, of course, was the election of Donald Trump, an outlandish supervillain you’d expect to find in comic books. The result: the most vibrant, consistently engaging Gorillaz album yet. In keeping with how the project has evolved, Albarn puts the focus on curation rather than animation. When he sings, it’s mostly to play foil for his guests, who comes from the worlds of hip-hop, R&B, dancehall and club music. From “Clint Eastwood” to “Feel Good Inc” to “Stylo,” that’s always been the formula for great Gorillaz tracks: Albarn’s thin, listless whine paired with robust rapping and soulful singing. It’s uniquely British melancholy meets global musical wanderlust—basically everything Albarn is about. If the theme of Humanz is joyriding into headwinds of despair, Pusha T and Mavis Staples win the MVP for their glitch-gospel anthem “Let Me Out.” Pusha plays skeptic on the verses, waiting for Mavis to step up on the hook and proclaim, “Change coming/you’d best be ready for it.” After that, the brilliant “Hallelujah Money”—wherein poet and composer Benjamin Clementine croons Trump-style rhetoric like a David Lynch baddie—can’t help but seem out of place. There’s no time for subtle irony when Jehnny Beth of Savages and Noel freakin’ Gallagher are waiting one track later to rip your cynicism limb from limb. When they finally let loose on the aerobic synth-pop closer “We Got the Power,” it’s inspirational to the point of ridiculousness—an attempt to rouse the superheroes within us all. It’s a rallying cry for humanity that only a cartoon band could deliver.